I took this past week off from posting and stamping to spend time with family and finished up some spring cleaning. But, Friday is here and that means it is time for Beate’s wsc #43. I just love the grown-up, soft, professional look of this card. All items are current except for the Mini Library Clip (which I personally wish was still current). STAMP SETS USED: Stamp of Authenticity, Define Your Life, Defining Alphabet, and Form & Function Background stamp. 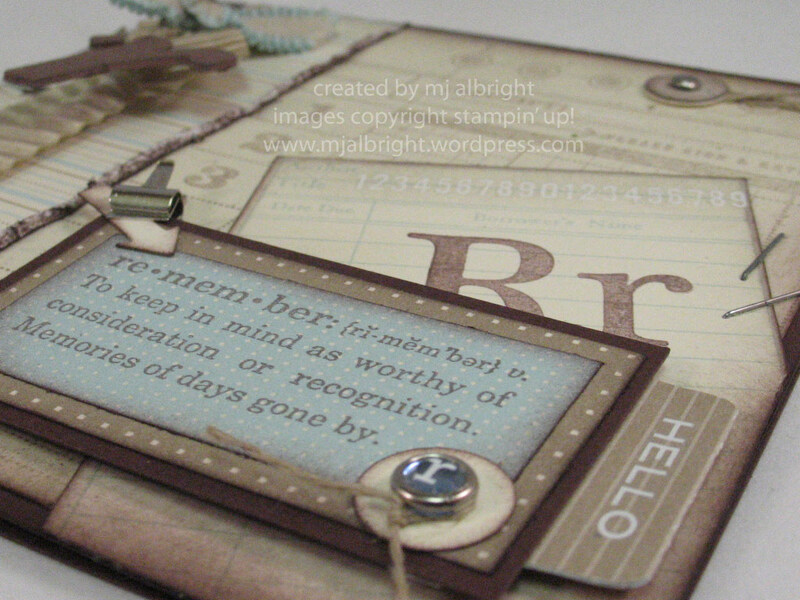 CARDSTOCK USED: Chocolate Chip, Very Vanilla, Confetti Cream, Notebook DSP. INKS USED: Chocolate Chip, Sahara Sand, Soft Sky, Craft Close to Cocoa. ACCESSORIES USED: Theater & Sherbert Ribbon Originals, Linen Thread, Ice Circle Rhinestone Brads, Silver Brads, Take Note Rub-ons, On Board Lots of Letters, Staples, Mini Library Clip, Round Tab Punch, Spiral Punch, My Way Punch, 1/2″ Circle Punch, Stampin’ Sponges. Oh how beautiful Mary Jo! I love this. Love the layers and the embellishments! WHOA. This is SO cool. So much going on, and yet it doesn’t look busy. Gorgeous! Yeah…WHOA!! Hold the phone!! THIS IS SO COOL! Mary Jo – I want to be you when I grow up! I love the colors, the layout, the ribbons and bling and stamps… WONDERFUL, WONDERFUL job with the sketch!! Have a fabulous weekend, friend! Jaw dropping, eyes bulging, FANTASTIC card! I love all the details. You always make incredible cards. WOW, MJ This is just fantastic! All your little details are just perfect! Love it! Very, very nice! Love those soft colors! This is so beautiful, I’m speechless! Absolutely gorgeous! Love all of the details that add up to one beautiful card! THIS is the bomb!!! I’ve really enjoyed really looking at this…there is so much to take in! The little nuances…they are what make your cards so special!! I just love this Mary Jo!! I hope you have a wonderful weekend! Fantastic card MJ! 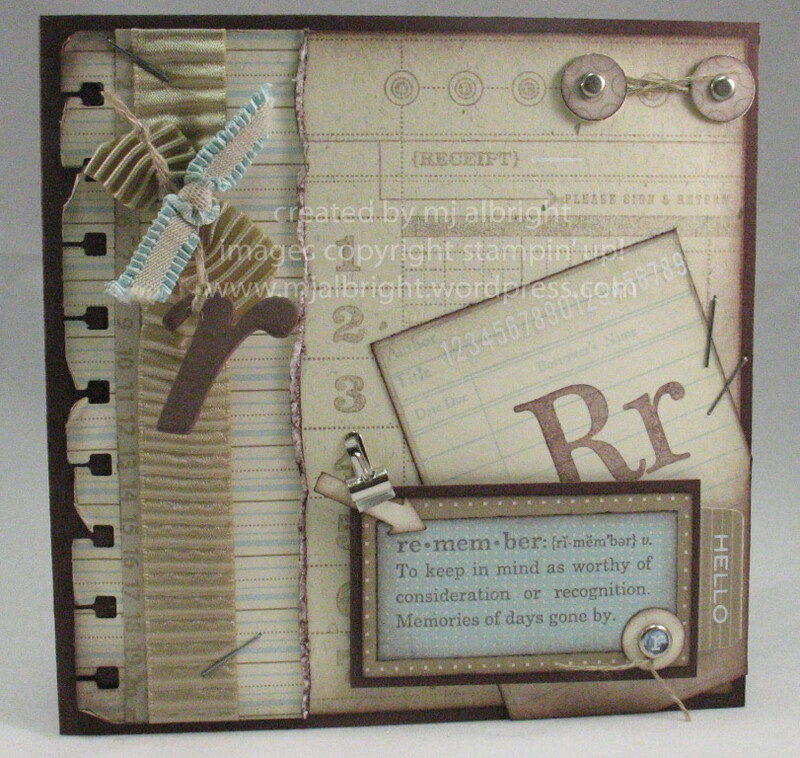 Love all the elements you have on this card…love it! Wow!! I love this card!! Love all your elements and love the vintage feel to it!!! Nice job!! Beautiful card Mary jo, your work is amazing and so inspiring! Hope you have a wonderful weekend. Absolutely GORGEOUS…love the soft colors and all of the layers!!! Love the soft colors and all the little details. MJ, love how you put this all together — great collage of wonderful things! I really like the soft colors, ribbons, just everything! I hope you have enjoyed your weekend!